MAGIC Telescopes observe the birth of a jet close to the event horizon. Over 250 millions years ago a powerful burst of very high energy gamma-ray radiation left the vicinity of a supermassive black hole in the nucleus of the galaxy named by astronomers as IC 310. 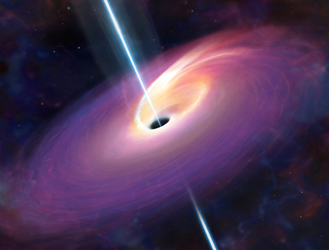 The flickering of the gamma-ray flare on time scales of less than five minutes shows that it originated from a region smaller than the event horizon of the black hole. This finding supports the idea that such an extraordinary emission was due to particles accelerated in an extremely narrow region located near the event horizon of the black hole, and permeated by strong electric fields. Such structures are expected to form near rapidly-spinning black holes that power radio jets by their rotational energy loss. IC 310 is a galaxy belonging to the Perseus cluster of galaxies at a distance of about 260 million light-years from Earth. It is famous for hosting a supermassive black hole of over 300 million solar masses. Supermassive black holes with masses ranging from a million up to few billion times the mass of the Sun are thought to reside in the center of all galaxies. In some fraction of these, accretion of matter onto these objects produces unusually intense emission visible as a star-like core called an active galactic nucleus, AGN. This accreting matter does not fall directly into the central black hole, but circulates around it in a dense disk. Supermassive black holes are expected to expel plasma jets at the expense of their rotational energy. They induce currents in the surrounding accretion flow associated with large-scale magnetic fields, collimating and accelerating charged particles. Jets of plasma are thus produced and ejected into the interstellar medium at tremendous velocities approaching the speed of light. The core of an active galaxy, powered by the central black hole and composed by the disk and the jets, is thus emitting light across the entire electromagnetic spectrum. IC 310 is famous for an extended radio jet emerging from its center. For decades, the origin of this jet has been a puzzle. It emits a power that corresponds to the radiation output from ten billion stars and emerges from an extremely compact central part of the galaxy. Employing the EVN network of radio antennas, high-resolution images of the jet in IC 310 revealed a very straight structure emerging from a compact core smaller than a light year. 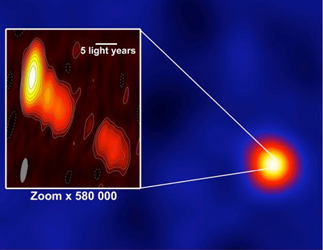 Fermi/LAT and MAGIC discovered very high energy emission from this galaxy in 2009. After these findings, IC 310 has been considered a very peculiar source and has been carefully monitored at all wavelengths. Left panel: artist view of the core on an active galactic nucleus. The supermassive black hole is at the center and, both, the accretion disk and the jet are shown. 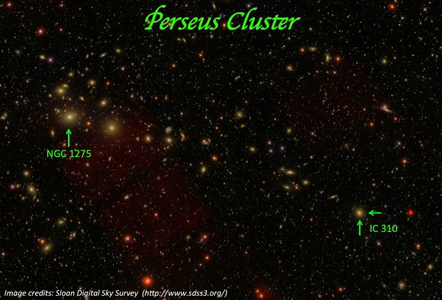 Right panel: Significance map (false color scale) of the Perseus cluster sky region in gamma rays observed in the night of November 12th, 2012, with the MAGIC telescopes. 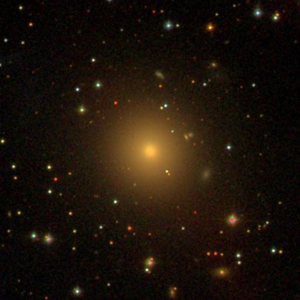 The bright source shown in the gamma ray image is IC 310. The insert shows the radio jet image of IC 310 at 5.0GHz obtained with the European VLBI Network (EVN) on October 29th, 2012. During a further observation campaign of IC 310, in the night of 12 November 2012 a very powerful gamma ray emission, coming from this source, was observed by MAGIC: this emission varied on time scales of less than five minutes. Information about the structure of the source is encoded in its variability. The shorter the variability time scale, the smaller the size scales that can be probed. A source region must be smaller than the distance that light can travel during the variability time scale. Since the shortest variability time scales arise at the highest photon energies, gamma-ray observations hold the clue to uncover the size of the jet formation region. Moreover, the event horizon of the supermassive black hole in IC 310 is known to be about three times as large as the Sun-Earth distance, and finding variable gamma-ray emission at only one fifth of this distance was a complete surprise. According to the current picture, the observed gamma rays arise at shocks traveling down the jet. However, the minimum time scale for the emission originating at shocks is given by the light crossing time across the event horizon which limits the radius of the jet from below. Now, the MAGIC observations tell a different story. If the plasma around the supermassive black hole is very rarified, the jets should develop regions near the rotational pole where the density is too low for charges to shortcut the electric fields arising due to the rotation of the magnetic field. These intensely electrified regions resemble the vacuum gaps in pulsar magnetospheres, which are known to accelerate particles to very high energies, exceeding more than ten thousand times the rest mass equivalent energy of the elementary constituents of matter, protons and neutrons, and tapping a significant fraction of the total outflow energy. Thus, the observations of IC 310 may be the first hint providing direct clues on the enigmatic jet formation process near black holes. This exceptional result obtained by using the MAGIC and EVN telescopes is now published on the issue of November 6th 2014 of Science Express.